The greying of European societies has created a number of challenges to the welfare state, one being soaring expenditures for elderly care. Ways of promoting healthy and active ageing have therefore been called for, since this would not only enhance the wellbeing and independence of older adults, but also keep public expenditures in check. Levels of social spending on aging populations vary significantly between welfare states, filtering through pension systems, eldercare, and other types of support. The social-democratic countries have traditionally been characterised by universal and generous welfare systems that protect vulnerable groups in society, including the oldest. Several recent studies suggest that universalism also has positive implications on general levels of social capital in societies. Consequently, levels of social capital might vary systematically between countries, depending on the welfare state characteristics and the generosity of welfare systems. Although previous studies have shown that social capital is strongly related to health and wellbeing, most previous research in the field of social capital and health has so far focused on pure associations and ignored the significance of the broader institutional and political context for the creation and maintenance of social capital and its potential health consequences. 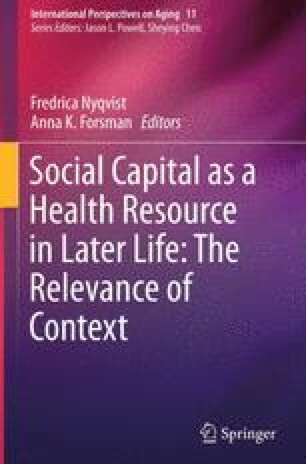 The aim of this chapter is to analyse the role of welfare state features for levels of social capital among older adults in a European setting and to investigate whether levels of social capital contribute to higher levels of health in this group. For this purpose we analyse cross-national data from the European Social Survey (ESS) in 2010. European Social Survey. (2013). ESS Data. http://ess.nsd.uib.no/ess/round5/. Accessed: 10 May 2013. Kangas, O. (1999). Social policy in settled and transitional countries: A comparison of institutions and their consequences. Ministry of Social Affairs and Health (8 July). http://pre20031103.stm.fi/english/tao/publicat/tandem/kangas/olli.htm. Accessed 3 March 2008.